An Equine Fusion Stud Kit. The Studs are easy to install and remove and 1 x kit will cover a pair of Equine Fusion hoof boots. 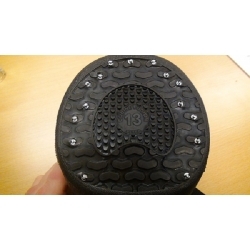 The studs enable the Equine Fusion hoof boots to get excellent grip in wet conditions, snow and ice. It is always recommended to use a Equine Fusion Hoof Boot Pad inside each hoof boot whilst using the studs to ensure a comfortable ride for your horse and the best duration of the sole and studs.